William Shatner, Leonard Nimoy and the rest of the U.S.S. Enterprise™ crew take to the skies in one of the most acclaimed and intriguing StarTrek™ adventures ever. It’s the 23rd century and a mysterious alien power is threatening Earth by evaporating the oceans and destroying the atmosphere. In a frantic attempt to save mankind, Kirk and his crew must time travel back to 1986 San Francisco where they find a world of punk, pizza and exact-change buses that are as alien as anything they’ve ever encountered in the far reaches of the galaxy. A thrilling, action-packed mission for the Starship Enterprise! Another one I enjoyed quite a bit. I loved the little extra comedy added to this movie. It made for a nice little change of pace. I also like how the movies continued to start basically where the last one left off. I especially liked the scenes when the crew went back in time to find the humpback whales... and how they were... as Kirk said... not at their best. I would have liked to have seen a bit more of a reaction from Gillian (the marine biologist) when she was beamed onto the ship and when she first seen Spock without the headband making it obvious he was an alien. It just seemed like it should have shocked her more then it did. Even with being prepared by what Kirk told her earlier. It's Stardate 8454.130 and a vacationing Captain Kirk faces two challenges: Climbing Yosemite's El Capitan and teaching campfire songs to Spock. But vacations are cut short when a renegade Vulcan hijacks the Enterprise™, and pilots it on a journey to uncover the universe's innermost secrets. The Star Trek stars are back for one of their most astonishing voyages ever, with all the fun and excitement fans have come to love. So buckle up for a thrilling leap into the unknown that's "as much a spiritual odyssey as a space adventure, and it's all the richer for it" (Kevin Thomas, Los Angeles Times). Going into this one I couldn't remember if I ever seen this one or not. While it isn't a bad movie... the storyline for this one didn't thrill me too much this time. I found myself just not caring as much as I have in the previous stories while watching. I really didn't care too much on the way he brainwashed most the crew into doing what he wanted. Though I must say I did get a bit of a kick out of the few short scenes of Kirk, McCoy and Spock camping. So far this is my least favorite of the marathon. The Enterprise™ leads a battle for peace in the most spectacular Star Trek™ adventure ever! After years at war, the Federation and the Klingon empire prepare for a peace summit. But the prospect of intergalactic glasnost with sworn enemies is an alarming one to Admiral Kirk (William Shatner). "They're animals!" he warns. When a Klingon ship is attacked and the Enterprise™ is held accountable, the dogs of war are unleashed again, as both worlds brace for what may be their final, deadly encounter. Directed by Nicholas Meyer (Star Trek II: The Wrath of Khan), this topical action-adventure soars with warp-speed excitement that's "impossible to resist" (James Verniere, Boston Herald). Costarring Christopher Plummer. Another one I never seen before today. I enjoyed it more then The Final Frontier... but still not quite as much as the previous movies. I really liked how this movie started. But for me it lost something starting at the trial. But then it improved a bit again once they were beamed back onto the ship. Overall enjoyable... but it could have been better. Well... it seems the only movie I seen before with just the original series cast was part 4. At least until now! I love Star Trek VI. Second only to Khan for me. I really enjoy IV too, but it's a bit of an odd one when you think about it! Stardate: the 23rd Century. Retired Starfleet officers James T. Kirk (William Shatner), Montgomery Scott (James Doohan) and Pavel Checkov (Walter Koenig) are guests of honor aboard the newly christened Enterprise-B. A test run takes an unexpected turn, however when the starship encounters two vessels trapped inside the Nexus, a mysterious energy ribbon. During a perilous rescue attempt, Kirk is swept out into space. Seven decades later, Captain Jean-Luc Picard (Patrick Stewart) and the crew of Enterprise-D rescue an El Aurian physicist named Soran (Malcolm McDowell). Unbeknownst to Picard, Soran harbors a deadly plan that includes the destruction of the Enterprise and millions of lives. Now Picard's only hope for a future rests within the Nexus...and a legendary captain from the past. I enjoyed this movie... even though I wouldn't say it is the best Star Trek movie out there.... it is still fun. I actually enjoyed watching the 2 Enterprise crews in the same movie. But there is some things I didn't like about it also. I especially didn't like Data's emotions chip. Someday I'll watch my stepdad's copies of these. Though I suppose I could claim the doubles..since it is my fault he has doubles. I think I've seen some of the first one. I saw the second one when it originally came out. I was...hmm...thinking 7 or so. I had seen reruns of the show by that point and I liked Spock. So. I was devastated by the ending. I kind of avoided Star Trek for years after that. I saw it again on tv years later and watched it..not knowing it was the one I'd been avoiding. I had blocked out everything except the ending. I've been thinking about trying to get the original series on dvd or Blu ray. Maybe someday. 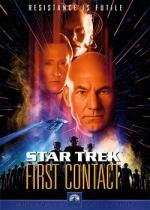 Captain Jean-Luc Picard (Patrick Stewart) and the Next Generation crew engage in their most thrilling adventure yet – a sci-fi action event that "stands proud and apart" (Richard Corliss, Time). They call themselves the Borg – a half-organic, half-machine collective with a sole purpose: to conquer and assimilate all races. Led by their seductive and sadistic queen (Alice Krige), the Borg are headed to Earth with a devious plan to alter history. Picard's last encounter with the Borg almost killed him. Now, he wants venegance. But how far will he go to get it? Costarring Alfre Woodard and James Cromwell and bursting with spectacular special effects, Star Trek: First Contact is one action film that "has it all" (Jim Ferguson, Prevue Channel). This one I enjoyed quite a bit. I really enjoyed the storyline of them having to go back in time to when First Contact was made. I haven't gotten far enough into Star Trek: The Next Generation to know too much about The Borg. And this movie does have a spoiler in it for me... what with showing what happened to Captain Picard... but I do think The Borg is a great enemy for the main characters. I also liked them showing a difference between the history books and what Cochran was really like. Not that he was a bad guy in any way... but at the same time he wasn't as great as their history books made him to be. Engage! Captain Jean-Luc Picard (Patrick Stewart) and his Next Generation™ crew are back and so is the excitement and fun in this "polished film that shines like a crown jewel in the Star Trek™ firmament" (George Powell, San Francisco Examiner). From the beginning of the Federation, the Prime Directive was clear: no Starfleet expedition may interfere with the natural development of other civilizations. But now Picard is confronted with orders that undermine that decree. If he obeys, 600 peaceful residents of Ba´ku will be forcibly removed from their remarkable world, all for the reportedly greater good of millions who will benefit from Ba´ku´s Fountain of Youth-like powers. If he disobeys, he will risk his Starship, his career, his life. But for Picard, there´s really only one choice. He must rebel against Starfleet ... and lead the insurrection to preserve Paradise. This one felt like a double length episode more then a movie to me for some reason. I'm not saying that is a bad thing... as I did like this one. That being said there was some things that didn't work in this one. That mostly being the comedy they tried to add. I especially had to shake my head at Data becoming a flotation device. I did like that they went back to the series on some things. Like the Riker/Troi relationship or Geordie wanting to see normally. And that right there could be why it felt more like a double length episode to me instead of the theatrical movie that it is. Also, towards the end of the film, when Khan engages the Genesis device, he recites Ahab's damning soliloquy as he harpoons the white whale. Set a course for a galaxy of unparalleled action and adventure as Captain Jean-Luc Picard (Patrick Stewart) and his Starship crew battle a chilling new adversary...that just happens to hold a shocking link to Picard! In the wake of a joyful wedding between Riker (Jonathan Frakes) and Troi (Marina Sirtis), Picard receives another reason to celebrate: the Romulans want peace and the captain will be the Federation's emissary. But as the Enterprise™ heads towards the Romulan Empire, a brilliant villain awaits - harboring a diabolical plan of destruction and an unimaginable secret that will give Picard his most fearsome challenge. Costarring Brent Spiner, LeVar Burton, Michael Dorn, Gates McFadden and introducing Tom Hardy as Picard's deadly foe. Star Trek Nemesis is "Exciting! Inventive twist-plus the unexpected shoot sparks of surprise throughout the picture." ...Gene Shalit, Today . Wow... this one I actually had trouble getting through. It just didn't hold my attention nearly as much as any of the previous movies. It actually felt like work trying to watch it. And is it me... or did they ignore a lot of what we already learned previously. I just found the main storyline disappointing... if not a bit boring. This is definitely my least favorite Star Trek movie of the franchise. The future begins in J.J. Abrams' smash hit STAR TREK. When the Romulan Nero comes from the future to take revenge on the Federation, rivals Kirk and Spock must work together to stop him from destroying everything they know. On a thrilling journey filled with incredible action, the new recruits of the U.S.S. Enterprise will voyage through unimaginable danger in one of the biggest and most critically acclaimed movies of the year. This is the second time I have watched this movie since I bought it last November. I definitely enjoyed it! It had a lot of great action. This movie did a wonderful job at revitalizing the dying franchise. I loved what they did with all the characters. I don't think you could ask for a better cast. I thought the effects were just stunning. Up to this point The Wrath of Khan has been my favorite Star Trek movie. This one is right up there with it. I don't think I could choose what is better between the two. I think that would depend on my mood. If I felt like something with the extra stunning effects or what. Story-wise... for me... it is pretty darn close. Well... This marathon was a lot of fun... but I am pretty much Star Trekked out. Definitely need a brake from it for a while.